The FASE Micro-Copter is an octo-copter. Its 8 propellers provides powerful lift that allow to carry a pay-load of up to 2.2 kg, enough for a DSLR photo or compact video camera. A camera gimbal, active stabilised on 2 axis, provides space for large DSLR cameras such as Canon 5D. Camera horisontal angle, vertical angle and photo shutter are controllable from ground station. The octo-copter provides stable flight and safety due to redundant motors and propellers. The powerful electrical motors assures agile flight in all directions and makes precise navigation possible. The electrical motors emit no fumes and only minimal noise. At close distances of 10 m the octo-copter is clearly heard, but at 30 m distance it is noiseless. An on-board GNSS (Global Navigation Satellite System) is used for flight control assistance and automatic position hold (air parking). 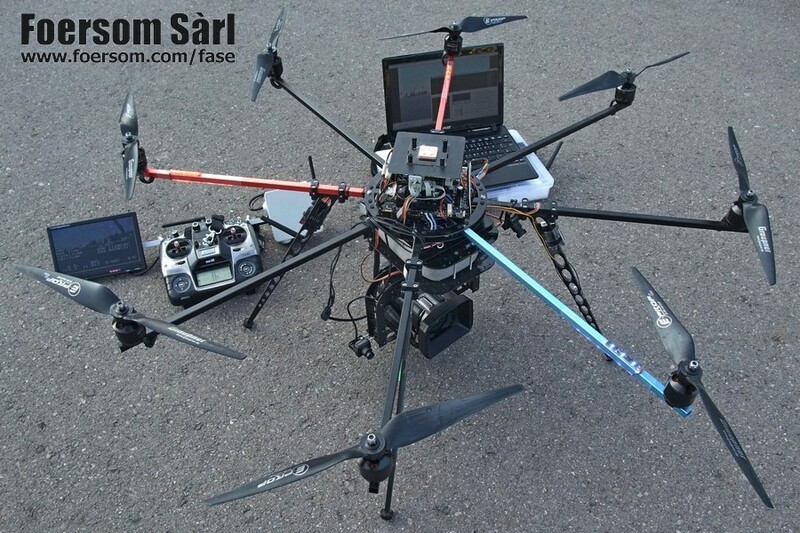 The FASE Micro-Copter generation 2 features dual live video links. One video transmission of flight camera and dashboard On-Screen Display (OSD) links the micro-copter to the ground station and allows accurate flight control and operation. The second video link is for monitoring of recording camera.